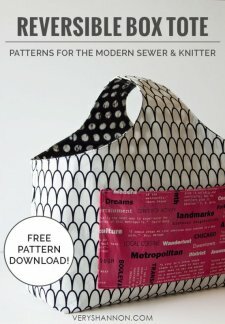 "I've got a new FREE pattern for you all today! I'm on such a huge project bag/tote/pouch kick this year! I just can't seem to get enough and the Reversible Box Tote is just what I needed! "Perfect for carrying around all my knitting projects, journals, notes, & yarn spools! Heck you could even use this for the beach, for shopping, as a purse and more! The shape holds a ton and is so comfy to carry! 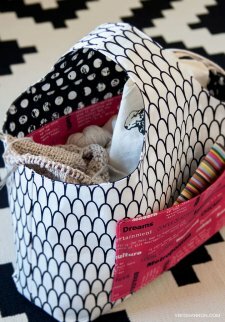 I've been wanting a project tote that I don't have to wear over my shoulder. With my bad back sometimes I just find it easier to carry them by hand and let's admit it - some of my normal totes end up dragging on the ground or I get scared they are going to rip carrying all my loot around."